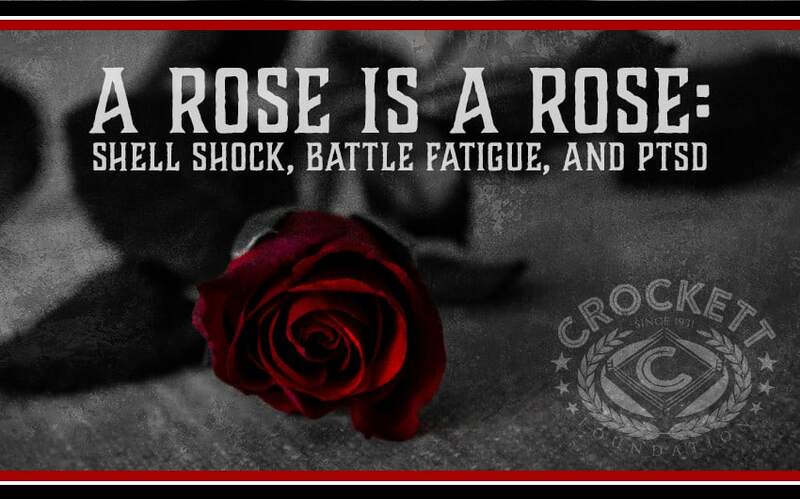 A Rose is a Rose: Shell Shock, Battle Fatigue, and PTSD | Crockett Foundation - Tag In & Help Out! What we call Post Traumatic Stress Disorder today was called “shell shock” just after World War I. At first shell shock was thought to be the result of damage to the brain, unseen, caused by concussive explosions of large guns – artillery shell explosions. Common symptoms of shell shock included panic and problems sleeping. During World War I soldiers were frequently sent right back into the war zone after only a few days of treatment for these shell shock symptoms. In World War II nearly half of US military discharges were attributed to combat exhaustion. In 1952 a new medical publication changed things. The American Psychiatric Association created the Diagnostic and Statistical Manual of Mental Disorders (DSM-I), and it included a diagnosis of “gross stress reaction” for people who were medically relatively normal, but who had symptoms caused by traumatic events – for example disaster, or combat. However, it became a problem that the diagnosis presumed that a soldier’s reaction to trauma would be resolved relatively soon. The protocol was that if symptoms remained at the 6 month mark another diagnosis had to be made. By the 2nd edition of the DSM, in 1968, the diagnosis was eliminated from the manual – despite the growing evidence amidst the Vietnam War that psychiatric problems were indeed associated with exposure to the traumas of war. Instead the DSM-II included the condition “adjustment reaction to adult life” – which did nothing to capture Post Traumatic Stress Disorder (PTSD) exhibited by soldiers. The diagnosis of “adjustment reaction to adult life” was limited to 3 examples of such trauma: Ganser syndrome (marked by incorrect answers to questions by prisoners who were on death row), unwanted pregnancy with thoughts of suicide, and fear associated with military combat. In 1980 the American Psychiatric Association added PTSD to the 3rd edition of the DSM. This resulted from research with Vietnam Veterans, Holocaust survivors, and sexual assault survivors among other groups. With this entry links between the traumas of war and life afterward were established. A major difference came about in the DSM-5, where PTSD was no longer classified as an Anxiety Disorder. Feeling keyed-up, or over reacting to situations. Diagnosis of PTSD doesn’t occur unless the person is experiencing all 4 of these symptoms. They need to last for at least 1 month and also cause significant distress or problems with the person’s daily functioning. Studies show that the more extensive, prolonged, and horrifying a person’s exposure to the traumas of war is the more likely they will in turn become exhausted and emotionally worn out. Considering it is often the strongest and healthiest individuals who are put into such situations it makes perfect sense that these warriors are those who are most likely to suffer from Post Traumatic Stress Disorder. The Crockett Foundation helps fund the best Veterans charities out there, who are providing Service Dogs to Veterans with PTSD and facilitating therapeutic recovery programs. You may read about their mission and donate to help improve the lives of Veterans regaining joy in life while living with mental illness such as PTSD. I’m self-diagnosed with ADHD and PTSD. I’m having trouble finding help. My physician says that they can’t give referrals; nor, can they be involved in sharing records with Behavioral Specialists”! A walk-in clinic says they can’t see me because they don’t accept my insurance. How can it be so difficult to get mental/emotional help. Is it not just as serious as a physical ailment? I know suicides are largely under-reported as such; but, that’s what happens when people can’t find relief.